We'll focus on the two races named after icons in their fields. The RED SMITH STAKES restarted in 1960 as the EDGEMERE HANDICAP. The EDGEMERE first started in 1901 at the old Aqueduct Racetrack, open to all horses and run at one-mile and seventy-yards on dirt. The race paused between 1909 and 1916. In 1917, the EDGEMER returned to action uninterrupted at Aqueduct until 1956 when it was run at Jamaica Racetrack. What was believed to be the final EDGEMERE was raced June 20, 1957 at Belmont Park. 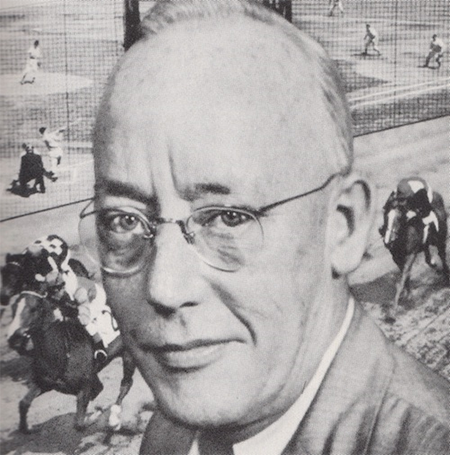 The new version of Aqueduct's EDGEMERE HANDICAP commenced in 1960 and was renamed the RED SMITH HANDICAP in 1981. Walter Wellesley "Red" Smith is a famous, Pulitzer Prize winning sports journalist who is probably best known for his work at the New York Herald Tribune and New York Times. For many in the sports journalism world, Red Smith is the standard and an icon. The 2018 race in his honor features 10 horses, three-years-old and up running 1 3/8ths miles on the Aqueduct turf. It should be a good betting race as the morning line favorite, ZULU ALPHA (PP: 3) is a lukewarm 5/2. The gelded five-year-old likes to stalk the early leaders and make his move into the stretch. Our handicapper sees ZULU as one of the prime players in our pro-subscribers' bonus commentary. "BIGGER PICTURE has the highest lifetime, turf speed figure in this group, meaning he has the highest ceiling. INSPECTOR LYNLEY has been close since coming off the bench on August 11th. His recent fractions suggest he is in top form. ZULU ALPHA is a neck away from winning four in a row, including a W over top-choice. POSTULATION is making his third start after a layoff. He should be at/near his best." From the Grey Lady (a.k.a. The New York Times) to the silver screen. The BOB HOPE STAKES is Captain Obviously named after the famous comedian/movie star Leslie Townes Hope, otherwise known as Bob Hope. For many, Bob Hope is best known and highly respected for his is work with the United Service Organization (USO), which entertains active duty military personnel. 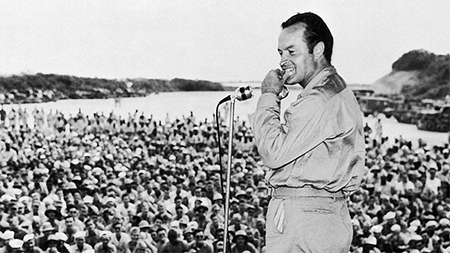 Bob Hope did 57 tours, entertaining the troops for 50-years, from 1941 until 1991. Amazing! He died in 2003 at 100-years-old. Eleven-years later in 2014, the HOLLYWOOD PREVUE STAKES was renamed the BOB HOPE STAKES. The HOLLYWOOD PREVUE STAKES dates to November 1981 and it was run at the shuttered Hollywood Park. It's fitting that a race named to honor a great Bob has been dominated by a Bob. Trainer Bob Baffert has won two of the first four BOB HOPE Stakes, taking the crown in 2015 and 2016. Baffert has a chance to add his name to winner's list again with two of the seven contestants: METROPOL (PP: 1 ML 4-1) and morning line favorite MUCHO GUSTO (PP: 3 ML 5/2). "Bob Baffert's horses could run one-two, we'll put METROPOL on top of MUCHO GUSTO because 4-1 odds are better than 5/2. SPARKY VILLE is making his second start off the bench. He scored his top speed rating in his last in first after a layoff, a favorite angle. EXTRA HOPE broke his maiden in crushing style, winning by 8 3/4s in the fourth try at first W."
Although it's a slow weekend for $100,000 plus stakes races, it's still a weekend with plenty of horse racing action. We've got you covered with full card selections covering 20 tracks on Saturday and 13 tracks on Sunday. Make sure you look at our Best Bets as we've been on a hot streak of late. For example, on Tuesday the 13th, fifteen of our 17 selections hit the board with eight winners. Who says 13 is unlucky? GET OUR FULL CARD AQUEDUCT AND DEL MAR PICKS AND BEST BETS!